Chip Donahue Wrote: A brilliant, eye-opening collection. Very useful research. 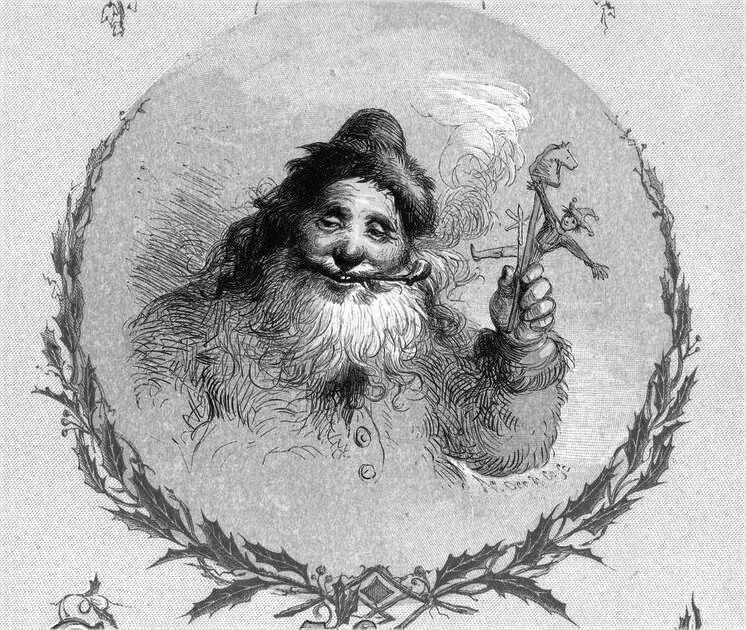 A collection of literature and verse concerning the Christmas Spirit in all its forms:Old Christmas, Santa Claus, Father Christmas, hogfather, etc..along with a detailed anthropological analysis, relevant songs and recipes. For the Kindle edition go here click. 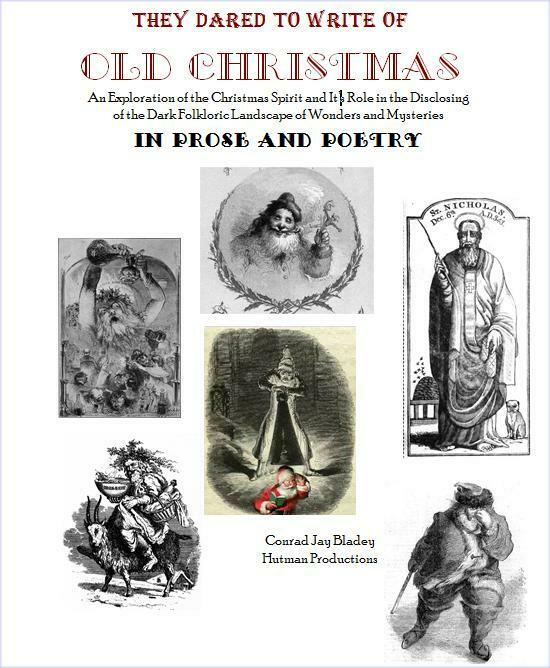 Please send me____________copies of They Dared to Write Of OLD CHRISTMAS An Exploration of the Christmas Spirit and It’s Role in the Disclosing of the Dark Folkloric Landscape of Wonders and Mysteries In Prose and Poetry, 394 pages. Author, Conrad Jay Bladey, ISBN: 978-0-9854486-7-7 at $29.00 a copy. This includes media mail postage in the USA. For Priority Mail in USA only =$32.00 For other countries or faster postage send an e.mail to inquire to cbladey@verizon.net . I am enclosing payment of U.S. Dollars, $ . Earworm 4 Ivor Cutler, “Go and Sit Upon the Grass”, Velvet donkey, Virgin Records, 1975.
i propose that the dark folkloric landscape is disclosed/inferred by artifacts of celebration, customs, spirits etc……. one way disclosure is advanced is by the construction and maintenance of artifacts of disclosure, cumulatively using the broadest range of human experience rather than selectively based upon the received views of the present. “practice makes perfect!” Without practice and implementation of artifacts of disclosure understanding and explanation will be limited. Curation and storage are necessary but not sufficient. We live in a world filled with abstract, unseen, eternal mysteries and wonders. It is the dark landscape of the human conditions filled with dark matter made visible only indirectly through folklore and celebration. To make it visible we cover it with artifacts. Once disclosed we can make our way more efficiently, avoiding its swamps, pitfalls, and mountains, to go about our life’s journey. The “physics” of the relationships between our disclosing artifacts and the underlying landscape -the black folkloric matter, if you will-has not been explored. Folklorsts have been distracted by history and physical description, collection and recording. Our challenge is to explore this new frontier. The stories presented in this small collection are artifacts from the huge Santa/St. Nicholas/Old Christmas/ Father Christmas/Christmas Spirit…. genre. Essentially they describe personifications of the season. As probably the most didactic genre in existence outside the more instructional books of the Bible, its goal is to teach us how to live in the dark, invisible, yet strangely tangible and physical landscape of the human conditions. St. Nicholas and Santa Claus lead our way, demanding obedience, encouraging us with gifts. Those lagging behind are tortured by Krampus and his crew. In addition to drawing your attention to the way these works disclose abstract landscapes, I also wish to draw your attention to the authors. Why did they create these artifacts of disclosure, celebration and instruction? How did they manipulate them? Were their attempts at disclosure successful? What did we learn, not about history or writing style, but about the eternal mysterious, wonderful, abstract landscape of the human conditions which we all share? I encourage you to explore the dark matter of folklore but also to take these works off of the pages and share them with others. Try your own hand at the work of disclosure. Writing as I am in the year 2015, I reflect upon a Christmas which, like so many holidays and celebrations, obtains its character from the present and its purpose from the ages. Christmas has always been composed of many cultural artifacts stitched together by many individuals and groups; maintained by a spectrum of supporting forces ranging from the changing seasons to universal human tendencies to political whim. These items are created in order to disclose eternal mysteries. Why are we still here? Why are there divisions in society? Why did life unfold as it has? There have been many course corrections and design changes. There are always elements of the Commercial, the Religious, the Secular as well as of Un-rule, a benevolent anarchy. The world paused through unrule and waived the rules in favor of a breath of decompression, of venting and of the exercise of exuberance. The Christmas Spirit has traveled a complex and often rocky road over the centuries, disclosed to us by the many artifacts of celebration which we have attached to it. The question is- Do we still see it through all the manmade accretion? Are there enough artifacts of disclosure? Do we still value them? Can we follow it and avoid the consequences? We should all realize that our celebrations exist to reveal and disclose universal mysteries so we might negotiate our way around them as we travel between the immensities of birth and death. In this light our celebrations are not arbitrary or optional. They are essential and mandatory. Without them we are at risk. It is not so much the presence of commercialism or conservatism that matters, but the dominance of the superficial manmade artifacts of celebration at the expense of the disclosure and adaptation to the underlying mysteries of the universe that should concern us. We achieve balance by carefully considering our universal human physical and emotional needs. When these are being met –when all are provided for -we then will have a holiday that renews, cures and re-creates our universal humanity. The authors represented here dared to write of these awesome mysteries. Dare to follow them!